A cultivar of Camellia japonica L. The flowers are crimson marked with white. [ICR]. 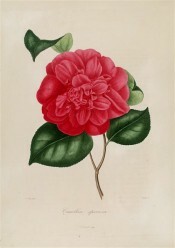 ‘Flower [of Camellia Speciosa vera] large, beautiful, full, of a deep cherry-red; No.5, petals of the exterior in two or three rows, large, regular, recurved upon the calyx, those of the centre irregular, multiplied, close undulate, rumpled, having a little white spot on the superior part; corolla three inches in diameter. – Superb.’ [Berlèse Monography p.81/1838]. Berlèse also figures ‘Speciosa vera’ in his Iconographie, crimson flowers unmarked with white. It is not unusual for trees bearing red or pink flowers marked with white to also bear flowers entirely of the darker colour. [Berlèse Iconographie vol.1 pl.57/1841]. Berlèse writes that Camellia Speciosa vera was introduced from Japan by Captain Rawes. [Berlèse Monography p.101/1838]. Speciosa is now generally regarded as a variegated flower, white on crimson. This may be a sport of the plant described by Berlèse. Macarthur sold two plants of ‘Speciosa’ to Bailey and sons of Adelaide in 1853. This is the first mention of the cultivar in the records. It was never listed in the catalogues. ‘Speciosa’ was among the camellias positively identified at Camden Park by Walter Hazlewood in the 1930’s. He gave no description. [TJSC]. Speciosa is listed in both the 1830 and 1836 editions of Loddiges’ Nursery catalogue, copies of which are held at Camden Park [CPA]. In the 1836 edition it is marked with an ‘x’, which elsewhere denotes common before or long introduced. Interestingly ‘Speciosa’ was also marked ‘o’ in an article by ‘G.A.L’ in the Horticultural Register. This book originally belonged to James Bowman and only later to Macarthur. The code ‘o’ indicates new to the colony. [HR p.635/1832]. It was included in desiderata to Loddiges’ Nursery, 6th January 1845 and this is the probable source [MP A2933-2, p.28].